Tucked away in Jerusalem's Old City is the Cathedral of Saint James. It rests in the narrow streets of the Armenian Quarter and is part of a monastery-seminary-church complex that serves the faithful. The Cathedral is particularly interesting, as it is one of few 12th century structures to have weathered the ravages of time. The pursuit of James the Great requires exploring its depths: blue tiles, wall paintings, carved stone crosses (khatchkars), and all. Why? According to tradition, the head of James the Great is buried here. Six lamps, an ornate vault and and overhead dome mark the spot. I'm far away from Jerusalem at the moment, in Camponaraya, Spain. But if I close my eyes, I can still smell the incense of the Holy City . . . as well as a few other odors that I can't forget. James the Great was beheaded in Jerusalem. Image from here. Accessed 7/21/2018. Ah, but this where it gets interesting. A medieval tradition suggests that that is exactly what happened. Here in Spain they call it the Traslación del Apóstol Santiago. Elsewhere it is called "The Golden Legend." In part 1 of "James goes West" (you can read it here) we noted how the Western Christian tradition (but not Scripture) suggests that James the Great visited Spain in his life. This took place in the decade or so between the crucifixion of Christ and James's execution. A facsimile of the Codex Calixtinus on display at Santiago's Museum of Pilgrimage. The notion that James made a second journey to Spain in his death is what the Traslación or the "Golden Legend" is all about. The idea springs from a medieval mishmash called the Codex Calixtinus. How this compilation of songs, sermons, and stories came into being is a woolly matter, well beyond my energy and ability to comb. Needless to say the Calixtinus reached its final form in the mid-12th century just in time to offer authoritative advice (à la Rick Steves in wooden shoes?) to pilgrims seeking to walk the Camino de Santiago or "the Way of Saint James." The need for such a guide is a matter of speculation. I can't help but wonder if one of the impulses behind the Camino phenomenon was a response to the increasing difficulties of pilgrimage to the true Holy Land. By the mid-12th century the 1st Crusade had crashed and burned and even the best that Richard the Lionheart could muster would not bring it back (see here for our experience of the Crusader's "Alamo" of 1187). The Holy Sites of the East were slipping out of the reach of the West. If a pilgrimage was needed, it needed a challenging but achievable target. One must be cautious here, but I also wonder if there might have been a political motive under the table. The impulse of the Camino and the effort of the Calixtinus established the primacy of Santiago de Compostela over all other churches in Spain. Possessing apostolic remains can do wonders for your portfolio. Driven by these and other motivators, James goes west, at least in proclamation. You can almost hear the echo: And just as he goes, so should you. This image shows the body of James (complete with head) being transported on a boat (also complete with sail and rudder). His disciples gather around. This scene is a part of a presentation found on the Altar of St James (silver, 1287–1456), Pistoia Cathedral (Cattedrale di San Zeno). Image from here. An outline of James's post-mortem journey sounds like this: a very long time ago the disciples of James moved his body from Palestine to a remote corner of Galicia (practically the "end of the earth"). This transport and reburial was accomplished with supernatural help. Once James was put to rest other miracles occurred. This confirmed for many that the finger of God was at work. That's the gist of it, more or less. Don't think about it too much though; the outline is easy enough to control, but the details are untidy. This multiple-scened depiction shows the body of James being moved from Palestine (far left) to the Iberian Peninsula (far right). Note that James's head is still attached. Pooh on the Armenian claim! Image from here (accessed 7/21/2018). Prayers were offered and amazingly, the stone boat bearing the body of James crossed the Mediterranean without sail or rudder. It glided "upon the bosom of the flowing water" for more than 2,000 miles. ** It passed through the Gibraltar Strait (the "Pillar of Hercules") did a hard turn to starboard and ultimately landed on the Atlantic coast of old Galicia. The boat was received by local disciples who tied it to a big rock (pedrón) and took the body of James inland. They placed on a bed of solid stone--which somehow swallowed the body--and then the site was subsequently lost for the next 800 years. That is truly legendary stuff, people. I just feel badly for the Armenians. They got a spot, but they ain't got no story. "Hove a dusky barge dark as a funeral scarf from stem to stern. "** The death-journey of James the Great has the feel of a knightly romance. 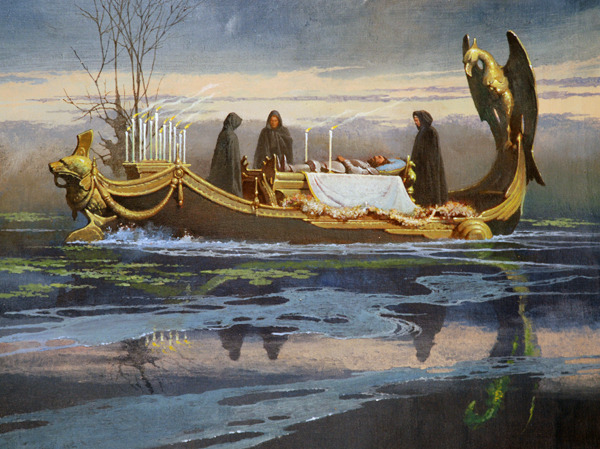 Once cannot read the story of his boat gliding pilotlessly across the sea without recalling scenes from Arthurian legends, the account of Elaine of Astolat, or even Tolkien's funeral scene of Boromir. This image was found here and accessed 7/26/2018. *Need to do some homework here. It is possible that James's story here is mixed with Celtic legends that describe the last journey of ancient heroes. Their journey went west into the deep Atlantic Ocean in a stone boat. **Nod here to Tolkien's description of the death of Boromir in The Lord of The Rings (Book V, Chapter 4). ***Another nod. This one goes to Alfred Tennyson and his poem on the death of Arthur. See the full text here.